My sweet tooth is baring its fang(s) again, so we’re going on another round-the-world-tour to satisfy my cravings. Icelandic kanilsnúðar, or cinnamon swirls, are available all over Scandinavia in one shape or another. They differ from cinnamon rolls in that they’re small, about two-bite sized, and not drenched in icing. 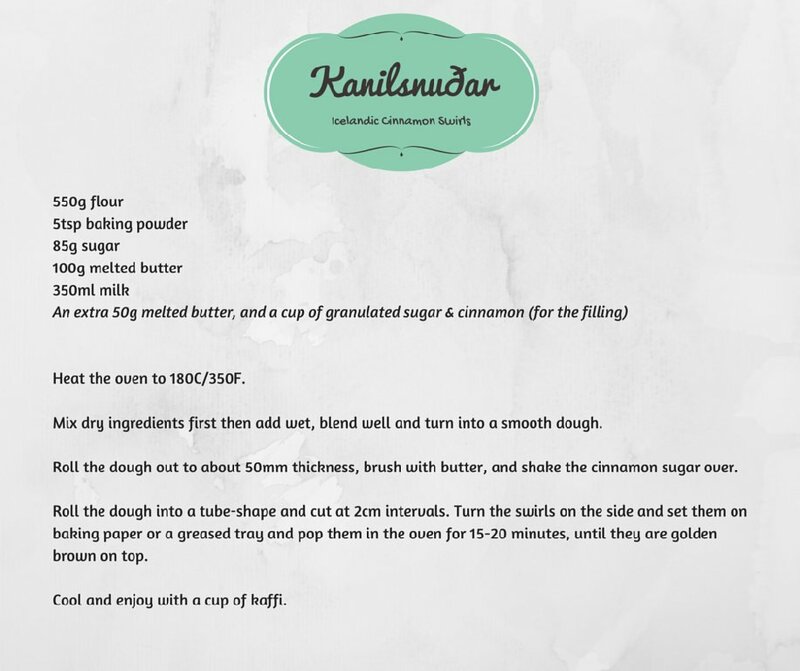 Most recipes involve dry yeast, but it’s just too darn fussy for me, so my recipe uses baking powder for an equally delicious result (click on the recipe to see a bigger version to read/print). Heading south of the equator on our tour, let me introduce you to another delicious South African treat: the koeksister. The rough English translation is cake sister, which really doesn’t paint a picture of plaited dough, deep-fried & drenched in sugar syrup. So wrong, and yet, so right! We had them at our wedding, which may have been a mistake alongside the carrot cake with the thick, thick fondant icing. Our guests weren’t shaking for joy, they were shaking with sugar! Koeksisters are best eaten fresh, with a palate-cleansing cup of coffee, but can be stored in the fridge for a few days (they never last that long, in my experience). I have been lucky enough to either have my friend, Hayley, make them for me, or just buy them from one of the zillion South African shops in London, but if I were to follow a recipe, I’d probably use this one for its simplicity: Tannie’s Koeksisters. The key is to make the syrup first, and have it really cool before you soak the koeksisters. And beware, prep and eating are both very messy. Persevere. The sugar rush will be worth it! There are also deep-fried donuts, kind of like beignets, called kleinur. Let me know how she goes with the kanilsnudar and I can send you the recipe for kleinur. Thanks! I will let you know.